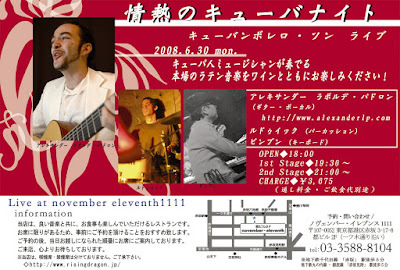 In June, Alexander will present a Cuban bolero music concert in Akasaka. He will play guitar and sing with a percussionist and pianist. The club is November Eleventh 1111 owned by a famous couple of Japanese musicians, Ryudo Uzaki and Yoko Agi, and it is known for a great sound system and wonderful cuisine. I am sure you can enjoy beautiful Cuban bolero sounds with wine and dinner. There will be a special guest from Cuba! The details are above and the flyer is attached although it is Japanese. The reservation is required. If you can make it, please call November Eleventh 03.3588.8104 or email to november11th@risingdragon.jp.